305 mm/52 Model 19074 х 3 pcs. 120 mm/50 Model 190516 х 1 pcs. Gangut — Soviet Tier IV battleship. Was part of the first series of dreadnought battleships built in Russia. She was armed with twelve main battery guns. The ship's features included a significant area of side armor and a general layout providing a full sideboard salvo at the widest possible angles. 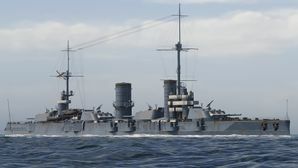 Gangut (Russian: Гангут) was both the lead ship of the Gangut-class dreadnoughts of the Imperial Russian Navy built before World War I and the last of her class to be completed. She was named after the Russian victory over the Swedish Navy in the Battle of Gangut in 1714. She was completed during the winter of 1914–1915, but was not ready for combat until mid-1915. Her role was to defend the mouth of the Gulf of Finland against the Germans, who never tried to enter, so she spent her time training and providing cover for minelaying operations. Her crew joined the general mutiny of the Baltic Fleet after the February Revolution and joined the Bolsheviks in 1918. She was laid up in 1918 for lack of manpower and not recommissioned until 1925, by which time she had been renamed Oktyabrskaya Revolutsiya (Russian: Октябрьская революция: October Revolution). She was reconstructed between 1931 and 1934 with new boilers, fire-control systems and greatly enlarged superstructures. During the Winter War she bombarded Finnish coastal artillery positions once. Her anti-aircraft armament was greatly reinforced in early 1941, just before Operation Barbarossa. She provided gunfire support against the Germans during the Siege of Leningrad despite being bombed three times and under repair for a year. Retained on active duty after the war she became a training ship in 1954 before being struck off the Navy List in 1956 and slowly scrapped. This page was last modified on 2 April 2019, at 07:21.